So I've been stalking checking and finding out what our two boys have been up to lately. While Matsuda Ryuhei is starring in a much awaited movie that's gonna be shown tomorrow in Japan. Directed by Ishii Yuya, "Fune wo Amu" (Assemble the boat) or "The Great Passage" (its official English title) is based on the award-winning novel by "Mahoro" author, Miura Shion-sensei-chan. Aside from the remarkable Ryuhei, it stars Odagiri Joe, Kobayashi Kaoru, and Miyazaki Aoi. Matsuda plays a nerdish, socially-awkward man who was working at a sales department of a book publishing company when he got entrusted with helping out in editing and compiling a new dictionary. He may have an uncanny knack for lexicography but is at a loss for words when he's faced with his landlady's daughter (Aoi). Looks like an intelligent light comedy with a bit of romance thrown in. So for those, like me who still can't let go of "Mahoro", here's something we can look forward to. So happy I got to watch Kouhaku 2011 live this NYE... awesome performances by everyone. And congratulations to Mao and the red team. Here's to more subbing projects, more wonderful doramas to see and, of course more arashi, rainbows, and fangirling happiness! And HAPPY NEW 2012, everyone! 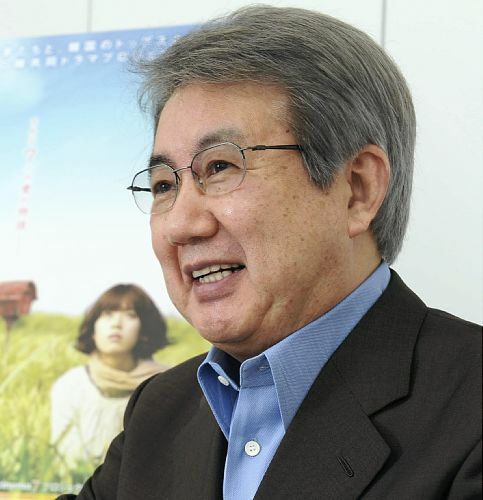 I was surprised to learn that Japanese screenwriter Ichikawa Shinichi had just passed away due to cancer at age 70. He was also a novelist, commentator, and playwright. I had just translated his last work, "Chouchou-san" so his writing and words are still fresh in my head. As I was going over the subs and translating them into English (with the help of danburi), I couldn't help admire the intelligent and meticulous way he incorporated historical facts into his script. And I especially liked the poem he wrote for Chouchou-san's last words. He will surely be missed. Japan has indeed lost a great and prolific writer. Kokorokara okuyamimoshiagemasu.